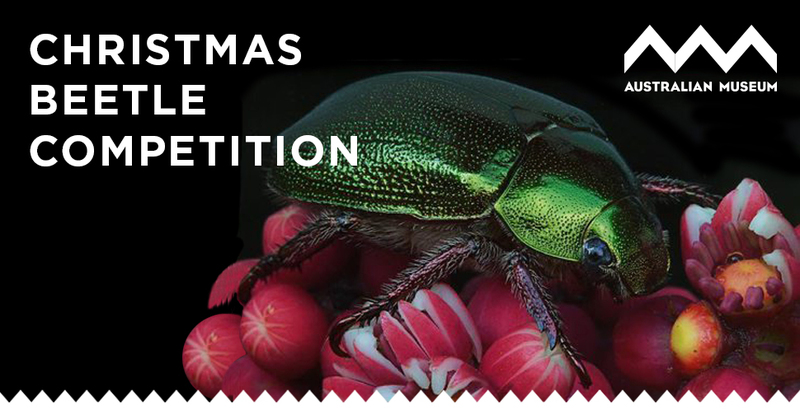 The Christmas Beetle Naming Competition (the "Competition") opens online from 28 November 2016 at 9AM (AEDT). Entry is open to residents of Australia aged 18 years or older ("Eligible Entrants"). By entering the Competition, you are accepting these terms and conditions. The Competition closes on 18 December 2016 at 11.59PM (AEDT). Entries received after that date and time will not be considered. The Prize includes a 1 Year Single Membership to the Australian Museum, to the value of AU$80. The Prize is valid for one year from the date the Membership is mailed to or collected by the winner. The Museum and the Entrant acknowledge that: the Entrant is providing their personal information to the Museum for the purpose of the Promotion and that their personal information is not being used in any way by the Museum. Entrants can only enter in their own name. Entrants who provide incorrect, misleading or fraudulent information are ineligible to participate in the Promotion and all entries of an Entrant who is deemed by the Museum to have provided incorrect, misleading or fraudulent information may, at the discretion of the Museum, be deemed invalid. The Museum reserves the right to request the Entrant produce (within the requested time) appropriate photo identification or other documentation (to the Museum’s satisfaction, at its sole discretion) in order to confirm the Entrant's identity, age, residential address, eligibility to enter and claim the Prize, and any information submitted by the Entrant in entering the Promotion, before issuing the Prize. If the documentation required by the Museum is not received or an Entrant or entry has not been verified or validated to the Museum’s satisfaction then all the entries of that Entrant will be ineligible and deemed invalid. The winners will be chosen by midday (AEDT) on 22 December 2016 at 1 William Street, Sydney NSW 2010. The winners will be notified via email or phone. The Prizes will be mailed to the winners if not collected in person. The Museum’s decision is final and no correspondence will be entered into. The Prize will only be awarded following any winner validation and verification that the Museum requires in its sole discretion. After the winner has been validated, the winner’s details will be published on the australianmuseum.net.au website. The Museum will not be responsible for any incorrect, inaccurate or incomplete information communicated in the course of, or in connection with, this Promotion if the deficiency is occasioned by any cause outside the reasonable control of the Museum, including but without limitation technical malfunctions or failures.